The effect of flowing water can erode channels quickly and cause extensive damage. Vegetative and soft armor solutions can calm water flow and reduce erosion while maintaining a natural look. Layfield had materials to help you build all types of erosion protection for channels. Featured products for channel protection are the Turf Reinforcement Mats (TRMs) and Erosion Control Blankets (ECBs). These materials can help you design natural-looking vegetated channels. Geoweb is a cellular confinement material which can be used to protect channels with much higher flow rates. 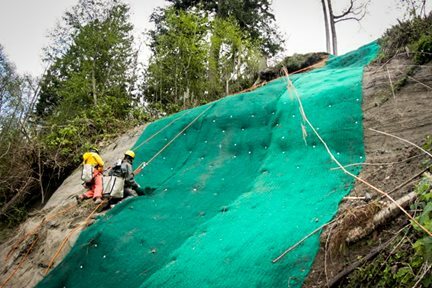 Layfield also has a complete line of geotextiles available that can be used with rock armor to create erosion protection on channels and shorelines.